Tarun is an Architect from Delhi, who has been working in rural india for the last several years. 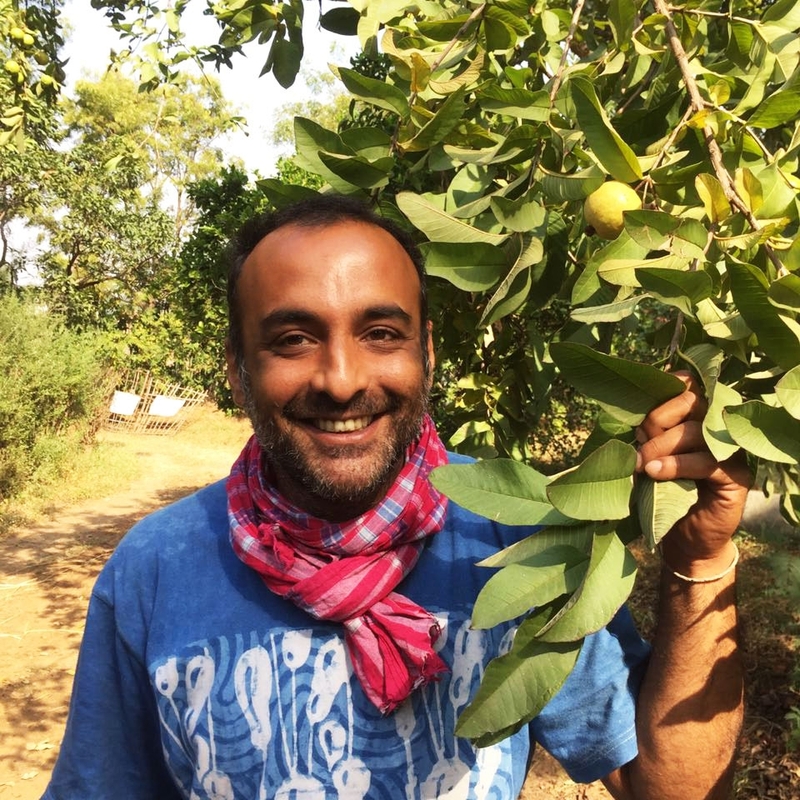 The journey started with his involvement with the Barefoot College in Tilonia Village, Rajasthan, where he started a native tree nursery and heirloom seed production unit. He now runs an organic farm in Jamudi village, in the Anuppur district of Madhya Pradesh. Nestled at the base of the Amarkantak plateau where the Narmada originates, the farm is surrounded by mixed deciduous forests and paddy fields. Shaym Bahadur Namra, the late owner of the farm was a Gandhian Social Activist, who left his home in UP to come to the Tribal Belt of Central India and set up Ankur Farms in Jamudi village, to promote vegetable farming. After the Bhopal Gas tragedy of 1984, he vowed never to use any chemicals on his farm and it has been an organic farm ever since. The farm has a varied orchard with Mango, Sitaphal, Lemon, Chikoo and Karonda, however Guavas are the mainstay. We also grow rice, wheat and millets (kodo is the local millet in this region) along with vegetables, mushrooms and medicinal plants. The central idea of the enterprise is to find local seed and preserve it by growing, what we like to call a living seed bank. So from Cereals and pulses to vegetables and even fruit, we endeavour not only to grow in an organic and sustainable way, but to identify and preserve native seeds. Our Farmer Tarun Jayaram is offering a combo box of Guavas with two varieties that grow on his orchard. The 2 varieties are - . - Pink Fleshed Guava - This variety has a beautiful pink colour on the inside flesh. Is between crispy and soft. The variety is sweet and looks beautiful to serve. - Allahbadi Safeda - The regular guava variety, the flesh is white in colour and the seeds are hard. The taste of the fruit is amazing. The fruits are grown on a farm which has been 100% Organic since 1984. You can taste the goodness in the fruit.